PRINCETON, NJ — U.S. small-business owners are substantially more optimistic than they have been in several years. The Wells Fargo/Gallup Small Business Index in January increased to +45, up from +24 in October and the most positive score since the third quarter of 2008. However, optimism is still below the high levels recorded pre-recession. These results are from the most recent update of the Wells Fargo/Gallup Small Business Index, based on telephone interviews with 603 small-business owners conducted Jan. 6-10, 2014. Small-business owners are modestly more optimistic in terms of their future expectations across most of the six key components that comprise the index, including more positive expectations about hiring in the coming year. Expectations for hiring in the next 12 months rose from 16% in the fourth quarter of 2013 to 22% in the current poll. Expectations for having good cash flow also increased in January, with 57% rating cash flow expectations for the next 12 months as “good,” compared with 52% in the fourth quarter of 2013. Expectations for increases in revenue in the next 12 months rose to 48% in the current survey from 44% last quarter. More small-business owners rated their cash flow in the past 12 months as “good” than did so in the fourth quarter of 2013 (52% vs. 46%, respectively). Fewer small-business owners reported having difficulty obtaining credit in the most recent poll (23%) than did so in the fourth quarter of last year (27%). 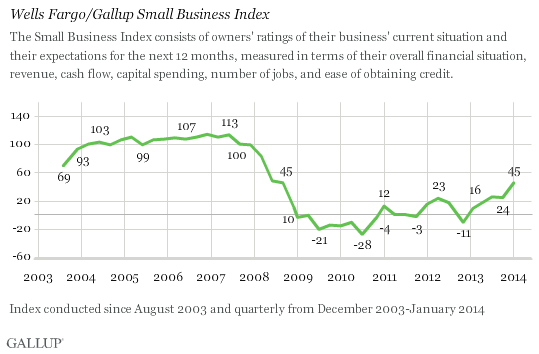 After reaching low points in 2009 and 2010, and again late in 2012, the Wells Fargo/Gallup Small Business Index has generally been on the rise throughout the last five quarters, and is now as high as it has been since mid-2008. Despite this significant improvement, however, this indicator remains substantially below where it was in pre-recession years — as is true with other Gallup economic measures. A key to improved U.S. job creation in the months to come will be whether small-business owners’ greater optimism translates into actual steps to expand their businesses — including investing more in their businesses and hiring more workers. Since August 2003, the Wells Fargo/Gallup Small Business Index has surveyed small-business owners on current and future perceptions of their business financial situations. Visit the Wells Fargo Business Insight Resource Center to access the full survey report and listen to Wells Fargo’s quarterly Small Business Index podcast. Results for the total data set are based on telephone interviews conducted Jan. 6-10, 2014, with a random sample of 603 small-business owners, living in all 50 U.S. states and the District of Columbia.For results based on the total sample of small-business owners, the margin of sampling error is ±4 percentage points at the 95% confidence level. Sampling is done on a random-digit-dial basis using Dun & Bradstreet sampling of small businesses having $20 million or less in sales or revenues. The data are weighted to be representative of U.S. small businesses within this size range nationwide. For more details on Gallup’s polling methodology, visit www.gallup.com.